Melatonin naturally regulates a person’s sleep-wake cycle. When sleep patterns are disturbed by traveling or other circumstances, falling and staying asleep can be difficult. 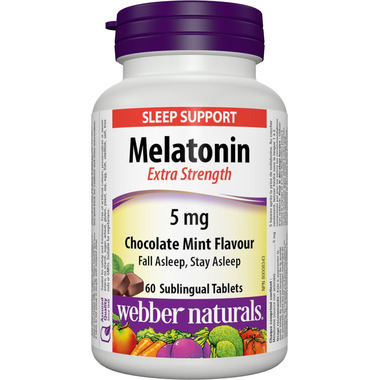 Webber Naturals Extra Strength Melatonin Chocolate Mint Flavour helps reset circadian rhythms and improve sleep quality, especially related to aging, sleep disorders and jet lag. Contains sublingual tablets.